I operate a small foundry in Essex specialising in the lost wax casting process, also referred to as investment casting, i can produce one offs and small batches which are often not viable for the larger foundries, who are geared up for runs of hundreds or even thousands with overheads to match. I offer my lost wax casting service to a varied array of customers typically, model engineers, antique restorers, classic and vintage car clubs, enthusiasts and anyone requiring bespoke lost wax castings, small batches, or low volumes, providing a personal touch sadly often not seen nowadays. The method I use is called Lost Wax which is a method that has been used for thousands of years and is now often referred to as investment casting. 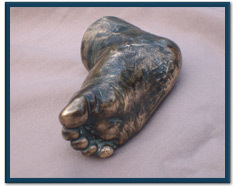 The castings can be produced in a metal of your choice, usually brass or aluminium or any other non ferrous alloy. The process will begin with a pattern, this can be from an old or original part, or one can be made from drawings using the latest 3D printing techniques, the whole process uses only the finest materials in the market place and ends with a top quality casting. The entire process from making the mould to polishing the final cast is completed personally by me to ensure a quality part is produced and that the customer is always delighted with the finished article. I rely largely on repeat business and referrals and TOTAL customer satisfaction is paramount. I am personally a classic car enthusiast and know only to well of the difficulties faced when sourcing parts, not wanting to compromise on quality whilst keeping an eye on costs.